Iconoclasm, and the Carolingians, which won the 2011 Otto Grï¿½ndler Prize, and The Republic of St. Peter: The Birth of the Papal State, 680-825. He has edited six books. He was a member of the Institute for Advanced Study in 1994 and the Netherlands Institute for Advanced Study in 1999-2000. He has been awarded fellowships by the National Endowment for the Humanities (three times) and the American Philosophical Society (twice). He was elected a Fellow of the Medieval Academy of America in 2004. In 2012 he served as president of the American Catholic Historical Association. B.C. ; Fathers and Sons in Athens: Ideology and Society in the Era of the Peloponnesian War; The Anatomy of Error: Ancient Military Disasters and Their Lessons for Modern Strategists (with Josiah Ober); Hegemonic Rivalry from Thucydides to the Nuclear Age (coedited with R. New Lebow); War and Democracy: A Comparative Study of the Korean War and the Peloponnesian War (coedited with David R. McCann); Rowing Against the Current: On Learning to Scull at Forty; The Battle of Salamis, the Naval Encounter That Saved Greece-and Western Civilization; The Trojan War: A New History; The Spartacus War; and Masters of Command: Alexander, Hannibal, Caesar and the Genius of War. His books have been translated into seven languages. His book The Battle of Salamis was named one of the best books of 2004 by the Washington Post. A Fellow of the American Academy in Rome with a Ph.D. in History from the University of California at Davis, Duane Osheim is professor of history at the University of Virginia. He has held fellowships from the American Council of Learned Societies, the American Philosophical Society, the National Endowment for the Humanities, and the Fulbright Program. He is author and editor of A Tuscan Monastery and Its Social World; An Italian Lordship: The Bishopric of Lucca in the Late Middle Ages; Beyond Florence: The Contours of Medieval and Early Modern Italy; and Chronicling History: Chroniclers and Historians in Medieval and Renaissance Italy. After receiving her Ph.D. from Brown University, Kristen Neuschel taught at Denison University and Duke University, where she is currently associate professor of history. She is a specialist in early modern French history and is the author of "Word of Honor: Interpreting Noble Culture in Sixteenth-Century France" and articles on French social history and European women's history. She has received grants from the National Endowment for the Humanities and the American Council of Learned Societies. She has also received the Alumni Distinguished Undergraduate Teaching Award, which is awarded annually on the basis of student nominations for excellence in teaching at Duke. The Ship, the Sword, and the Book: Western Asia, ca. 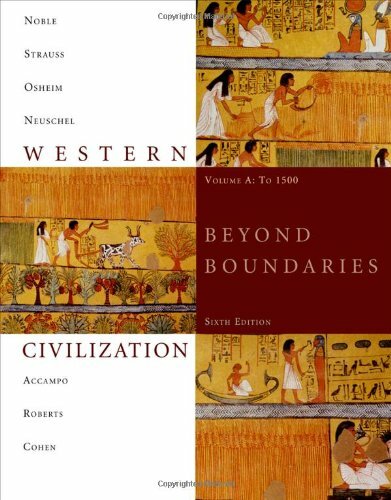 1500-400 B.C. The Greeks in the Polis to ca. 350 B.C. Alexander the Great and the Spread of Greek Civilization, ca. 350-30 B.C.